On March 9, North Korean dictator Kim Jong Un, a paranoid psychopath, displayed a nuclear missile warhead he threatens to launch against the United States and its allies. The public is being misled by the White House, some so-called “experts” and mainstream media casting doubt on whether the Great Leader’s threat is real. They claim North Korea has not demonstrated sufficient “miniaturization” of a nuclear weapon to be delivered by a missile. Technologically, “miniaturizing” a nuclear warhead is much easier than developing an atomic bomb or a multi-stage missile for orbiting satellites — as North Korea has already done. Ever since the USSR orbited Sputnik in 1957, analysts have rightly credited any nation that has tested nuclear weapons and orbited satellites with the capability to make a nuclear missile warhead. Miniaturization was no huge obstacle to the United States. According to the “Nuclear Weapon Archive” just a few years after destroying Hiroshima with an A-Bomb weighing 9,700 pounds, the U.S. Army had the T-1, a man-carried atomic landmine weighing 150 pounds. A major problem with warhead miniaturization was the bulky, heavy vacuum tube electronics of the 1950s. Microelectronics resulted in part from programs to miniaturize nuclear weapons. The president and the press is missing, or ignoring, the biggest threat from North Korea — their satellites. 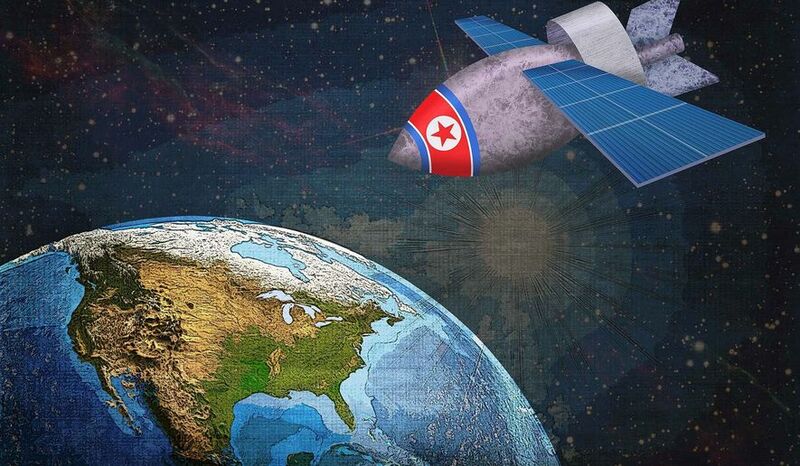 On February 7, North Korea orbited a second satellite, the KSM-4, to join their KSM-3 satellite launched in December 2012. Such an EMP nuclear warhead could resemble an Enhanced Radiation Warhead (ERW, also called a Neutron Bomb), a technology dating to the 1950s, deployed by the U.S. in the 1980s as the W48 ERW artillery shell, weighing less than 100 pounds. Are EMP warheads on those North Korean satellites? The immediate focus should be on Senate passage of the Critical Infrastructure Protection Act to protect the U.S. electric grid — not on the miniaturization problem myth. This entry was posted in EMP, North Korea. Bookmark the permalink. Hi Dr. Peter Pry; I’m a former reporter with the Wall Street Journal. I covered the Pentagon for several years and worked with Jim Woolsey on arms control matters. I’m writing a piece for Energy and Environment Publications, which publishes several Internet newsletters in Washington, D.C., on the electric grid an its vulnerabilities to GMD and EMP. I would like to talk to you about the impact of the Congressional EMP Commission. Although it ended in 2008, Its influence seems to be still with us. It did some interesting EMP experiments and had talks with Russian experts that gave us a better sense of the threat. If you’re up for a chat about this, let me know when and how to contact you. Mr. Albert W.L. Moore Jr.
Director Woolsey I know; Dr. Peter Vincent Pry I know…But!? YOU??? WHAT are you again?…It seems Your MARVELOUS CREDENTIALS have slipped by me. You make the types of insinuations, and innuendos, (not to mention outright accusations), that are HIGHLY REMINISCENT of a particular Psychopathic, chronic liar, that just tried to slip their way into the Oval Office…again. Possibly you have credentials that give you profound enough credibility to make such blatantly damning accusations; but, since I see no evidence that you DO HOLD such credibility; I’d suggest that you FIRST put forth your PROVEN ABILITIES in SPY CRAFT before you launch a full frontal attack on an CLEARLY & PROPERLY elected, (by “WE the People…”), President. (who could WALK to the podium without stumbling). AND! While you’re deriving your “C.I.A.ish” SPY CREDENTIALS., maybe you could also take the time to explain just WHERE you get the RIGHT, (or authority), to so denigrate a NEWLY ELECTED President. Until you do sir, I STRONGLY SUGGEST that you cease & desist your diatribe & rumor mongering. It’s HIGHLY UNBECOMING of an intelligent conversation. If you should happen to revisit your comment on this particular article, what are your thoughts now that Donald Trump is the POTUS ELECT(SELECT?)? Is he an enemy of the forces trying to subvert the USA from within and with out, a collaborator, or a useful idiot and well meaning stooge who will be manipulated to fulfill their agenda? I personally want to believe the first possibility, but tend to think the latter two are more likely. I’d be interested to see your opinion on this, sir. What the authors miss is that the pretender is a Quisling who has played a key role in the Comintern plot to inflict an electromagnetic pulse attack on the United States, which will cause the deaths of 90% of the American populace within the ensuing year, about 250,000 in the first hour as civilian aviation augurs in. Heard you on Coast to Coast 25 April 2014. Glad you got past wishful thinking on PRK capability. But you and others make fatal mistake of failing to perceive pretender is enemy agent. RINO failure to investigate in 2011, and continued stupidity since then, makes the flash all but inevitable. The pretender will let the sheeple believe the flash was a solar flare, a CME, and pass off invaders and oppressors as relief and rescue workers.